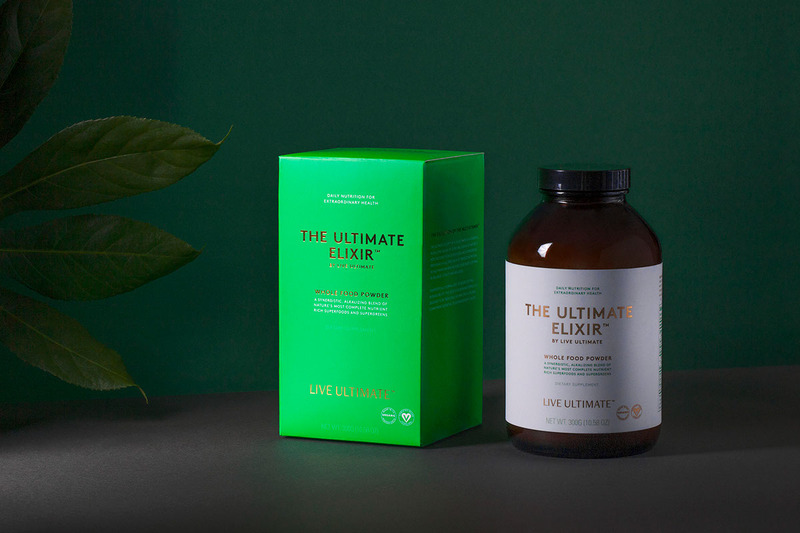 The Ultimate Elixir by Live Ultimate is a synergistic, alkalizing blend of Nature’s most complete, nutrient-rich superfoods and supergreens. 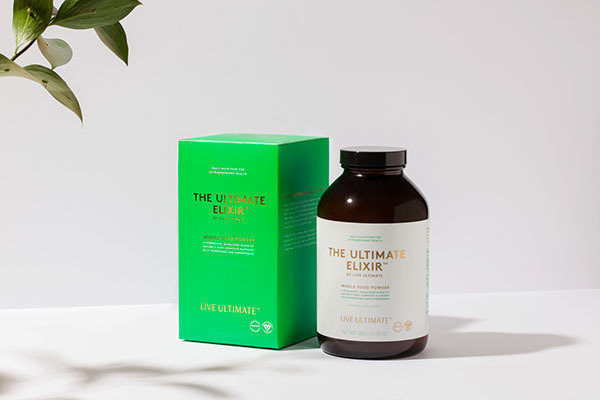 It provides a full spectrum of perfect nutrition to help maintain and restore your body’s optimal pH balance, vitality and wellness. The powder is organic, vegan and has nothing artificial in it. 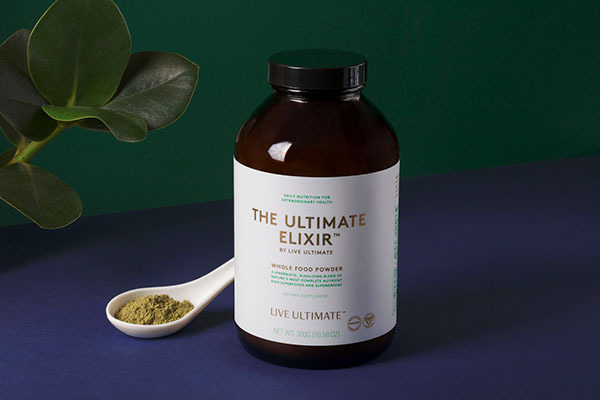 The packaging for this 100% raw, plant-based superfood powder needed to be strong, clean and fresh to express the high quality of its ingredients and the richness of the nutrients. It also had to be distinguishable enough to stand out from miscellaneous competitors. 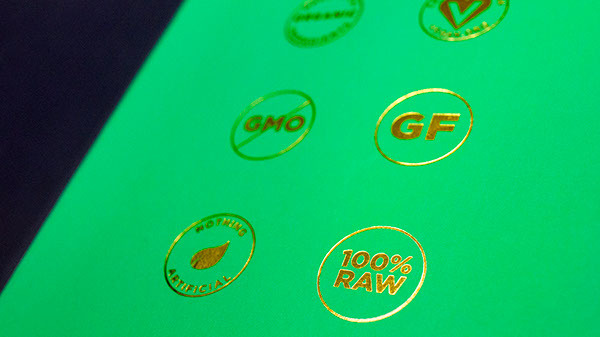 The eye-popping bright and crisp green color combined with the luxurious gold foil really communicates all that and reflects the energized and healthy feeling the powder gives to you. 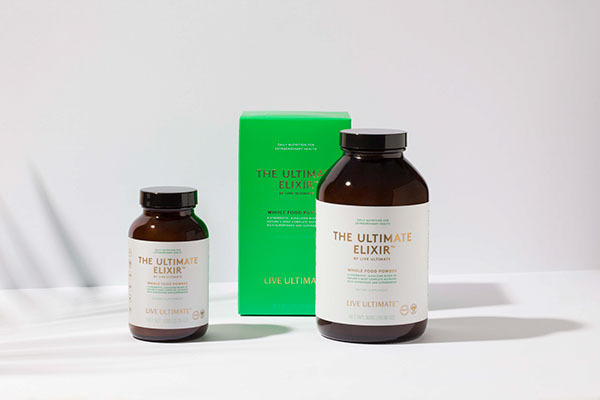 The Ultimate Elixir had to go together with the skincare line of the Live Ultimate, but also have it’s own identity, so we decided to keep the same typeface and the certain simplicity that is common to the skincare packaging. The graphics are kept simplified and straightforward for easily digestible message. The amber apothecary bottle protects the product from light, keeps the moisture out and communicates the medicinal aspect of the product. We also wanted to use only glass and cardboard to keep the packaging as environmental as possible. 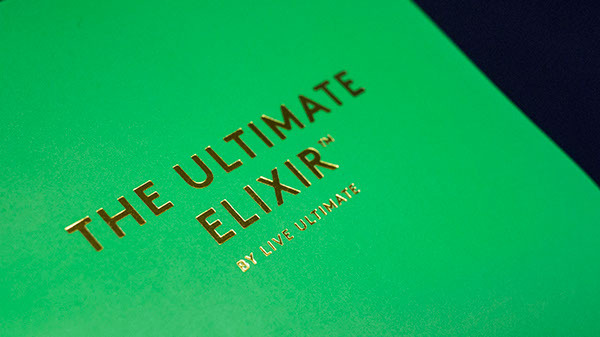 The Ultimate Elixir by Live Ultimate is a synergistic, alkalizing blend of Nature’s most complete, nutrient-rich superfoods and supergreens. 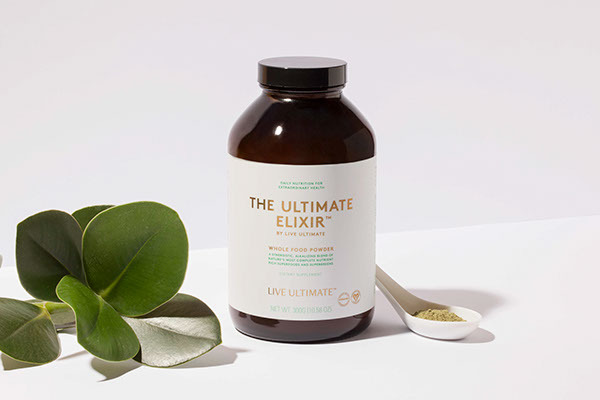 It provides a full spectrum of perfect nutrition to help maintain and restore your body’s optimal pH balance, vitality and wellness. The powder is organic, vegan and has nothing artificial in it. 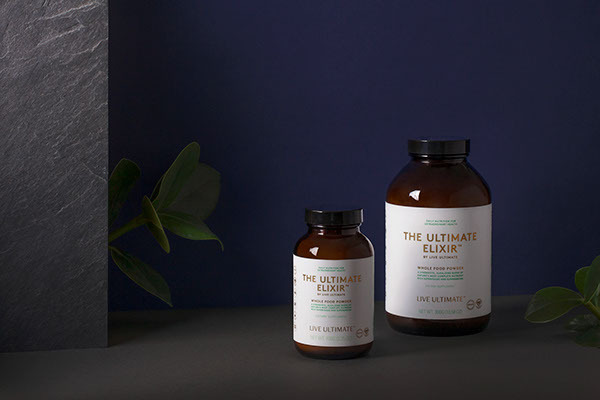 THE BRIEF The packaging for this 100% raw, plant-based superfood powder needed to be strong, clean and fresh to express the high quality of its ingredients and the richness of the nutrients. It also had to be distinguishable enough to stand out from miscellaneous competitors. 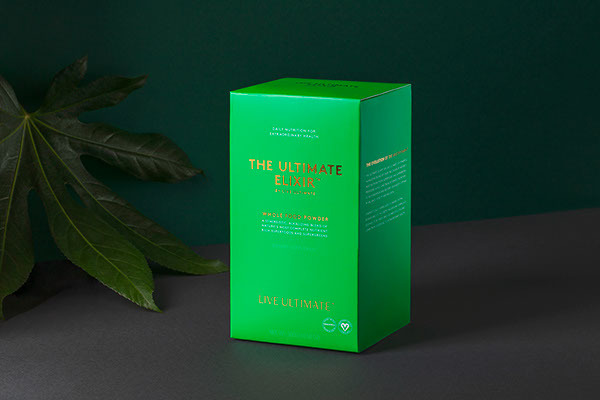 THE SOLUTION The eye-popping bright and crisp green color combined with the luxurious gold foil really communicates all that and reflects the energized and healthy feeling the powder gives to you. 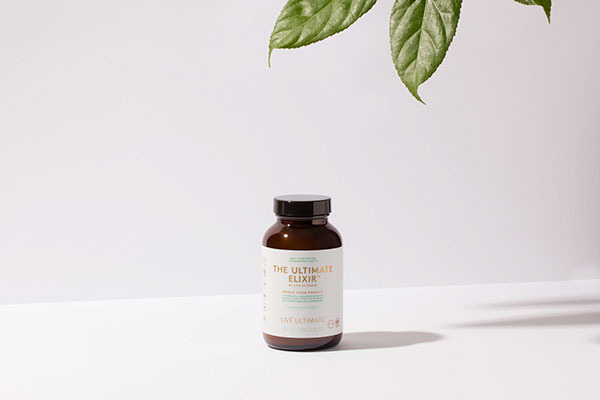 The Ultimate Elixir had to go together with the skincare line of the Live Ultimate, but also have it’s own identity, so we decided to keep the same typeface and the certain simplicity that is common to the skincare packaging. The graphics are kept simplified and straightforward for easily digestible message. The amber apothecary bottle protects the product from light, keeps the moisture out and communicates the medicinal aspect of the product. We also wanted to use only glass and cardboard to keep the packaging as environmental as possible.